In my post about large-diameter TBMs, I proposed using them to bore Boston’s North-South Rail Link. Like the official plan, this calls for two pairs of tracks, one feeding Back Bay and thence the Providence and Worcester Line and the other feeding the Fairmount and Old Colony Lines. Since there are three sites for stations – South Station, Aquarium (for the Blue Line connection and the north end of the downtown office cluster), and North Station – this calls for a design in which the middle station has right-way cross-platform transfers, and the two end stations have wrong-way cross-platform transfers. Here’s a diagram, consisting of half this arrangement. Top end denotes either North Station or South Station, bottom end denotes Aquarium. The assumed bore diameter is 12 meters, which corresponds to 1 meter = 16 pixels. The dashed lines are galleries punched at regular intervals into the two bores, connecting the platforms at stations. The assumed operating speed is 90 km/h; this requires a curve radius somewhat higher than 300 meters, about the lowest that can be achieved beneath the Central Artery, assuming no underground surprises. Moving one track aside, as done between the second and third image and between the fifth and the sixth, requires 3.4 meters of lateral displacement, which at this speed is almost all curve spiral rather than full curve, encouraging using a higher curve radius and shorter spirals. Near the lower limit of the curve radius that permits 90 km/h, the spirals would be longer than the curve itself. With a 1,000-meter curve the track would do the transition in 118 meters. Switching the heights of the tracks, as done between the third and fifth images, requires 5.5 meters of vertical displacement (possibly a bit more, depending on catenary clearances, but certainly not more than 6 meters); I can’t find information about vertical curve radius at low speed, but if the same vertical acceleration as at high speed works, then using Swedish standards, 1,300 meters works, in which case, with EMU-friendly 4% grades, the transition requires 190 meters. 118+190+118 = 426, less than the distance between each pair of stations, if not by the most comfortable of margins. The advantage of this configuration is that people making diagonal trips, such as between Framingham and Braintree, could transfer cross-platform at South Station. With two stations, as is the case in Singapore for the transfers between the North-South Line and East-West Line, passengers on one of the wrong-way pairs would need to travel one station farther than they have to on each line; with three, passengers between two points on lines north of Boston feeding two different tubes, for example Salem and Waltham, could transfer cross-platform at North Station. Finally, the reason for two tubes rather than one is that it makes the portals simpler, especially at the southern end. 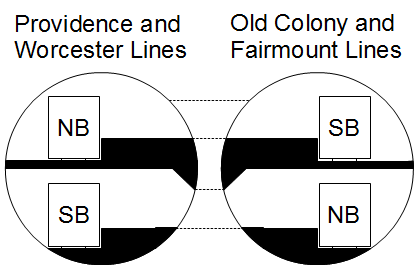 I discussed above the transitions between different configurations of tracks inside the tube, but the transitions from an at-grade two-track line to a two-track tube with one track above the other require more vertical displacement, and this favors two separate portals to the south, one pointing at Back Bay and one pointing due south toward Fairmount and the Old Colony Lines. Merging the two bores underground is possible, but the cost differential with just doing two bores all the way may not be enough to justify the reduction in capacity. It’s a clever idea, but I think the fundamental difficulty is that all of this has to dive under at least the Red Line, and almost certainly the Central Artery as well (which goes under the Red Line). Introducing a second level means you’re going that much further underground, which is somewhat bad for access, and makes the grades on the access tunnels that much worse. Between the Worcester Line having to cross over the Orange Line, and then descend all the way to two levels below the Central Artery (which crosses below the Red Line, which crosses below the Silver Line, which is below a mezzanine level below ground). I think with 4% grade it’s easily possible – there’s 2 km from the Worcester/Orange crossover to South Station. You’re right about the access problems, though. whatever kind of access they get it’s better than what they have now. Actually more like 1.3km, but at a 4% grade, that’s still doable, but it won’t work with a 3% grade. In terms of access, I have to wonder if there’s a way to thread an escalator through the mess of tunnels and to the northwest corner of Dewey Square, which might well be a net improvement in access over having to cross a bunch of heavily-trafficked roadways and a big empty plaza at grade. Similarly, an escalator on the south end could surface right at the bus terminal, and also improve access over the existing situation. The other big question is whether four tracks are really necessary, with the two huge tunnels, versus just having a single tunnel with two tracks side by side, or maybe even two or four single-track tunnels. I tried to work out headways from braking curves and dwell times, and 20 tph is doable on only two tracks, though a four-track South Station is probably required, both because it’ll have the heaviest load (and longest dwell time) and because it’ll be the main intercity stop as well. I couldn’t find it in four seconds’ googling, but I have a copy of an old N-S Rail Link major investment study and they came to similar conclusions—two tracks would be about 20 tph with Spanish solution platforms. FWIW they also recommend 12.5-meter tbms. Right now all of New Jersey Transit has only two tracks to Manhattan, and that’s shared with Amtrak (much more Amtrak through-traffic than Boston will have). NJT has about 5 times as much ridership as either half of MBTA commuter rail. Is it reasonable to say that MBTA needs 4 tracks while NJT will not in the conceivable future have more than 4? It seems to me that 2 tracks through Boston is plenty. As for where to build those tracks, are we sure a new tunnel is necessary? The Central Artery has 3-4 lanes in each direction. If one of these lanes was replaced by rail, a through rail connection could be created at relatively minimal cost. Not all EMUs on the market are short enough to fit in the tunnel, but some are. While there would be less room on the freeway for through passengers, the increased number of rail passengers would make up for that, and might even decreased congestion as drivers shifted to rail. If the capacity of this track pair was ever filled up, another track pair could be build using TBMs, big enough to hold Amtrak as well as the remaining commuter traffic. But that’s a long way off. First, the MBTA has lower mode share for suburbs-to-CBD commute traffic than New Jersey Transit, especially to the north (link). The suppressed ridership comes from MBTA service levels, such as North Station’s location outside the CBD. Second, the only reason NJT is expected to have just four tracks is that the costs have run over so much nobody thinks beyond that. I for one think NJT should be planning for both a Penn Station tunnel and a Lower Manhattan tunnel. Third, the Big Dig has room for tracks, but not for stations, unless a large portion of the roadway is closed, around 3 lanes per direction. SEPTA has four tracks for its commuter rail tunnel, its passenger volumes are similar to the MBTA. Don’t know how close to capacity the SEPTA tunnels are, though BART uses two tracks with maybe over twice the ridership but it’s at capacity at peak hours. Outside of New York City, driving has a 30% share and rail about 50% for trips into Manhattan. As for North Station being too far from the CBD, NYC’s CBD is large enough that a large fraction of workers aren’t walking distance from either Penn Station or Grand Central and besides cost and frequency, this must play a large role in avoidence of commuter rail (any time savings are eaten up by another subway transfer or long walk). The Big Dig actually left behind a provision for the Rail Link, should it ever be built. I’m not entirely clear on the actual specifics and I’m sure that the provision has its own engineering problems, but it is a fact that there’s a clean-roomed, nothing-but-dirt path through the mess of Central Artery tunnels. I’m confused what each diagram is supposed to represent. I thought each row represented a different station but there are more diagrams than three stations. They’re successive cross sections from the end stations (North and South Stations) to the intermediate station (Aquarium), with several tunnel cross sections taken in between. You state that “this calls for a design in which the middle station has right-way cross-platform transfers, and the two I end stations have wrong-way cross-platform transfers” as if it is completely self-evident, but disagree. I think that, on balance, right-way and wrong-way cross-platform transfers matter very little or not at all, and minimizing complexity is absolutely paramount. First of all, these are hardly “cross platform” transfers when you have to walk through some, likely narrow, mined connections between the two tunnels. Hardly any more convenient or quicker than using stairs or escalators to move between the two levels of one tube. Secondly, even assuming that the “cross-platform” transfer is in fact easier than the “up/down a level” transfer, doing as you propose benefits people transfering from one branch to another, but that comes at the expense of riders traveling from South Station to Aquarium or North Station, or conversely from North Station to Aquarium or South Station. For those riders, having all southbound services on one platform, and all northbound services on the other, would be the superior configuration. In all, though, I think the differences between all the potential configurations are so small that they should really just choose the option that is simplest and cheapest to construct, Even if it means no cross-platform transfers at all. Your option seems to require a much larger tunnel diameter than would be required for a straight through connection without the tracks dancing around each other like this, which would certainly be more expensive. Those transfers would require walking through narrow cross-passages, but they’d still involve no stair-climbing. They’re also surely involve less walking than anything involving a level change, since cross-passages can be punched at closer spacing than stairs and escalators. Passengers traveling between North Station and South Station would have to decide which platform to stand on, you’re right. However, it’s not that huge a deal. First, frequency on that trunk is going to be high all day, so having to let a train go because you stood on the wrong platform would only delay you maybe 5 minutes. And second, there could be electronic signs telling people when the next train is coming, so they’d know where to stand. The tunnel diameter would be the same either way. The official NSRL plan calls for two 12-meter bores already. A 12-meter diameter is about the minimum that accommodates a track and a platform on each level, and is also enough to let tracks swap levels entirely within the tunnel. This already involves compromises on platform width: in the diagram, the upper platform is in principle 6-meter wide, but only provides 2 meters of vertical clearance for 4.6 meters, which means in practice it’s about as wide as most Penn Station platforms. Of course, the platform itself is less obstructed than at Penn, and only faces one track rather than two, but this is already at the lower limit of what’s possible. But the tracks already get the ability to swap levels at this lower limit; the provision of cross-platform transfers in both directions does not require a larger diameter. Ot the will block the place where you can stand and decide which way to go when you hear a train coming. Like they do at Penn Station. Penn Station is a “local” station where experss trains happen to stop. Just because the archaic practice of only assigning platforms 10 minutes in advance happens at Penn station doesn’t mean it has to happen everywhere. Modernized operations would likely preclude this practice anyway. Since there would only be two platforms in either direction, probably. Like the subway platforms at Penn Station. Sorta kinda. I suppose they could put up signs that say something like “Next train to South Station this way”… and tie it into the signal system some how. Or just live with people lurking at the place where you can rush to the platform with the next train like they do at the subway stations at Penn Station where there are only three lines and four platforms. All of them “local”. Because they wanted to force people to make the cross platform transfers someplace other than Penn Station. Silly silly designers expecting there to be a lot of passengers at Penn Station. Joey, he’s talking about the subway station, not the commuter rail station. At Penn Station (both 1/2/3 and A/C/E) and at Atlantic/Pacific (2/3/4/5 only), the station layout goes platform-track-track-platform-track-track-platform; there are no cross-platform transfers between local and express trains, on the theory that passenger volumes are so high at train stations that transfers should be discouraged. Instead, passengers are supposed to transfer at Times Square and Nevins Street, which do have cross-platform local-express transfers. So if you traveled on the subway from Penn or Atlantic/Pacific, and could take either a local or an express train, you traditionally had to guess which platform to stand on, or try to dash to the correct platform as soon as you saw the train headlights. However, this is not the case anymore on the IRT stations, because there are countdown clocks at the entrances, so you can know which platform to wait on. I think it’s even worse at West 4th, because so many passengers are indifferent between the A and D, or between the E and F, or between the B and C, and each of those pairs requires standing on the mezzanine and rushing up or down a level when you hear a train (which probably turns out to be the wrong kind so you go back to waiting). And unlike Penn and Atlantic, people DO need to transfer at West 4th and end up having to use stairs; you’d think with all the IND overbuilding they could have gotten the cross-platform transfers right (but I guess they were planning for some 8th Ave trains to go to Houston/Rutgers and some 6th Ave trains to go to WTC, so transfers wouldn’t have been as necessary as they are today). You can’t see the headlights. You have to listen. Or did. It’s only useful for Times Square northbound and 14th Street southbound. Also, been following for a while but first post; never had anything great to say, but your posts are always interesting.